Along with a lot of not traditionally Italian baking, the good old English crumble has seemed to be gaining popularity - even modishness - in Italy. Preheat the oven to 190C/375F/Gas 5 and slip in a baking sheet at the same time. Put the amaretti into a freezer bag and bash with a rolling pin or similar, until reduced to coarse crumbs, then decant them into a bowl. Melt the two tablespoons of butter in a large pan (that has a lid), add the prepared plums, sprinkle in the two tablespoons of sugar, add the lemon zest and juice and shake the pan over the heat, cooking for two minutes without a lid and two further minutes with the lid on. These timings are based on having plums that are ripe: if the fruit is disappointingly unyielding, be prepared to cook for longer with the lid on, checking frequently. You may need to add the juice of the remaining half lemon - and more sugar - if cooking for much longer. 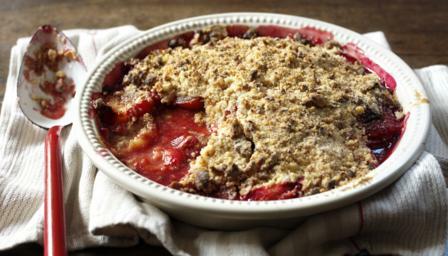 Pour the plums (with care - they’re hot) into a 23x6cm/9x3in deep ovenproof pie dish and set to one side. Already the red skins will have made a gorgeous garnet gravy. Sprinkle in two tablespoons of your amaretti crumble. To make the crumble the easy way, put the flour and baking powder into the bowl of a freestanding mixer, shake to mix, then add the small cold butter cubes and beat, not too fast, with the flat paddle until you have a mixture rather like large-flaked oatmeal. Or you can do this by hand, just by rubbing the butter into the flour with your fingers. Add the sugar and mix with a fork, then tip in the rest of the amaretti crumbs and use a fork to mix again. Pour the mixture over the waiting fruit in its pie dish, making sure you cover right to the edges to stop too much leakage: although for me, some of the rich-hued syrup spurting out over the crumble topping is essential. Place on the baking sheet in the oven and bake for about 30 minutes; you should see some ruby bubbling at the edges, and the top will be scorched gold in places. If you can bear it, let this stand for 10-15 minutes before eating, with ice cream, whipped cream or mascarpone.